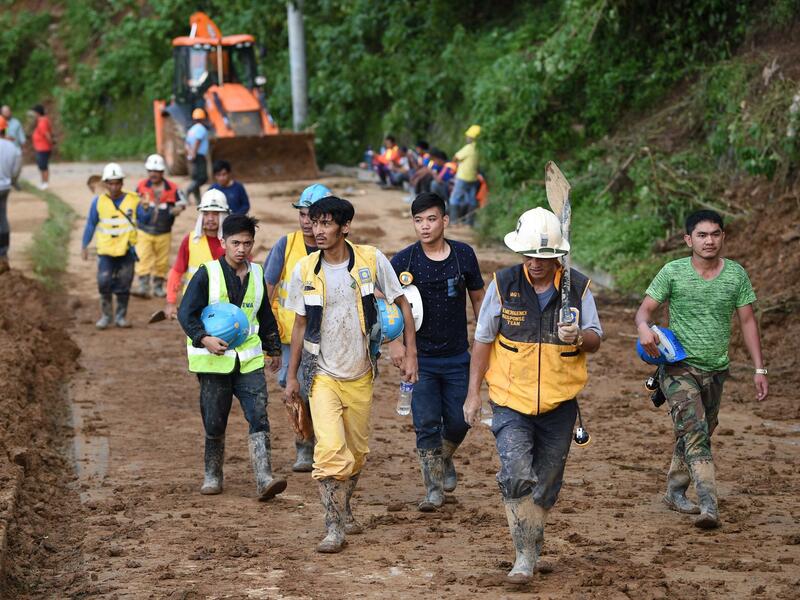 Volunteer rescuers head home after working to dig out victims of a landslide triggered by heavy rains from Typhoon Mangkhut in the Philippine's Benguet province on Monday. 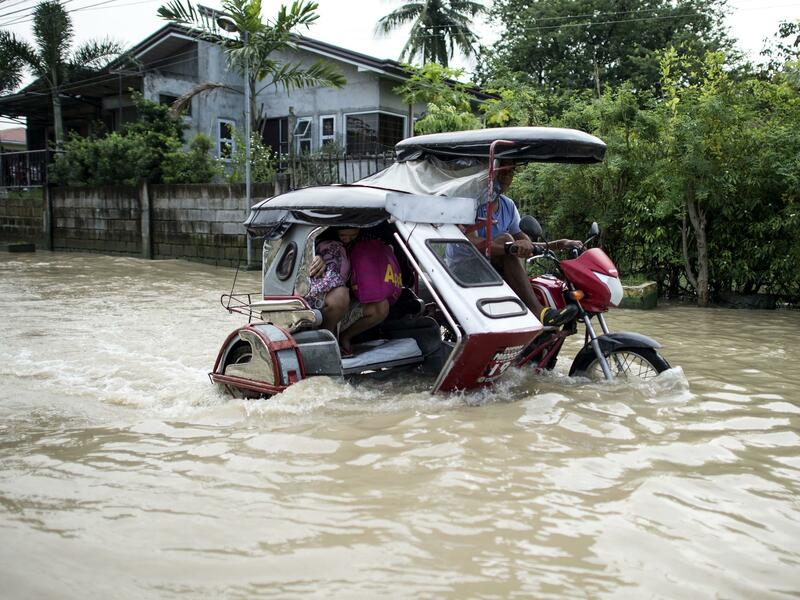 A rickshaw driver wades through a flooded street in Calumpit, Bulacan in the Philippines on Monday. Mangkhut damaged trees and buildings throughout Hong Kong. A man wades through flood water in Jiangmen, in China's Guangdong province on Monday. 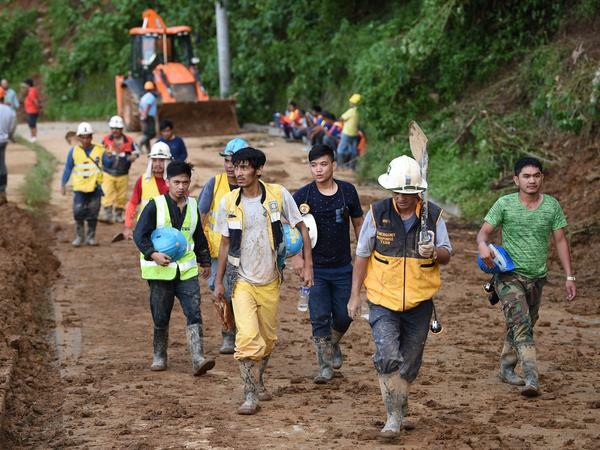 A mudslide has buried dozens of people on the Philippine island of Luzon, after Typhoon Mangkhut's powerful sweep. Gold miners and their families had sought shelter in an old bunk house that doubles as a church on Sundays, NPR's Julie McCarthy reports from Manila. The landslide reportedly struck around noon on Saturday, burying the building and all those inside. The mayor of Itogon told The Associated Press the miners and their families had been warned that the structure wasn't safe, but that many people had sought shelter there nonetheless. He said 11 bodies had been recovered so far; searchers had a list of 61 people believed missing, The New York Times reports. The AP reports that the storm has killed at least 66 people in the Philippines. McCarthy says that while Hurricane Florence in the U.S. has been slow-moving, Mangkhut has been the opposite: "It was fast-moving, and these winds brought down power, transmission lines, damaged bridges. The rain was falling for hours." All that rain is flooding the rice fields in the country's biggest rice-producing region, which could cause lasting effects to the food supply. "I'm dismayed because officials haven't come to see our situation," one farmer told McCarthy, as he looked out at his fields, now completely submerged. "And that has made it a lot harder for us." The storm moved on to China, first striking Hong Kong. It was one of the most powerful storms to hit the island. While the island avoided serious casualties, it suffered significant damage. "Mangkhut left more than 600 sections of road blocked by trees and other debris, and at the height of the storm, cranes toppled, scaffolding collapsed and skyscrapers swayed in the wind," NPR's Rob Schmitz reports from Hong Kong. "The storm slowed as it made landfall in mainland China's Pearl River Delta region. 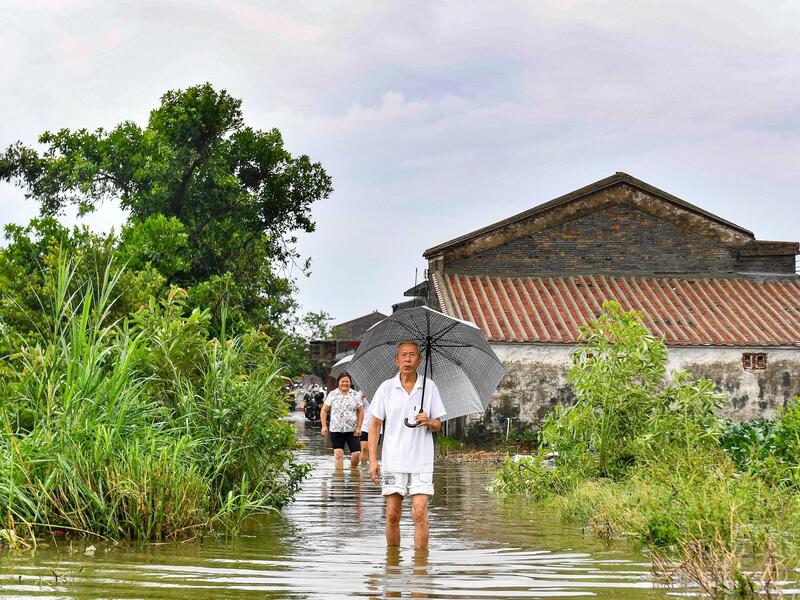 More than two million people have been evacuated in China's Guangdong province, and nearly 20,000 emergency shelters have been activated." 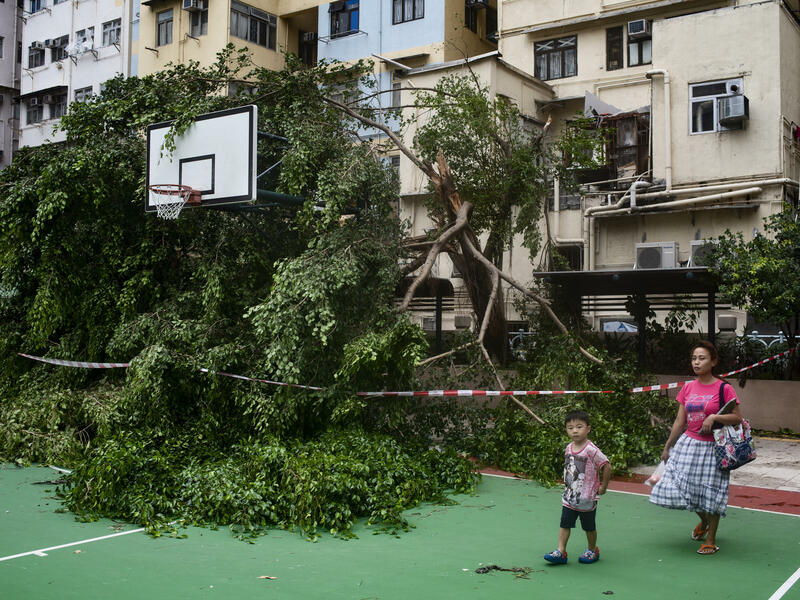 Authorities have reported four deaths on the mainland due to fallen trees and other debris. The storm has weakened from a typhoon to a low pressure area as it moves over southern China, according to the Hong Kong Observatory.